Ani Chudrun has long been a friend and supporter of BBG and for may years she was an ordained Nun. Recently she has become a householder and handed back her Nuns vows. 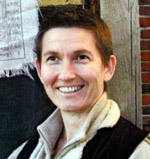 Like most of us she is navigating a dharma path which includes running a business and making money. This day retreat/ workshop is about dealing with some of the ethical issues which arise for all of us. ‘What is a fair price?’ How to live within an ethos of Right Livelihood and how to make an ethical living in a consumer based culture where the idea of money and self worth seem impossible to separate. Sometimes placating the ‘ethical’ demon and maybe undervaluing ourselves seems to be an easier option than asking the going rate. 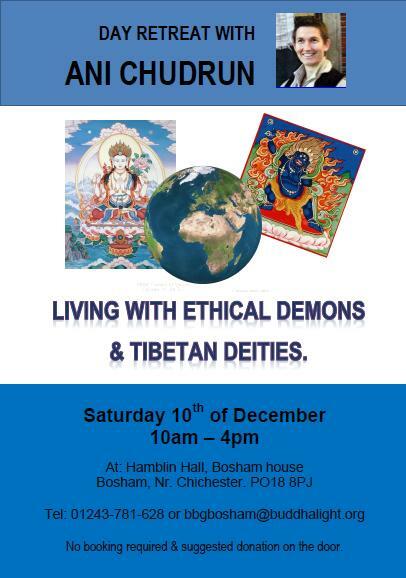 The retreat will be held at Bosham House on Saturday December 10th from 10am to 4pm and I’m sure it will create some debate and reveal some practical experience and solutions based on our dharma and especially Vajrayana practice. Even The Buddha and all his subsequent followers through the ages have to sustain themselves. Suggested donation £10 to cover the hire of the hall and a donation to Chudrun, however we urge you to come along and offer what you can, be it less or more! You are invited to bring lunch to share. This entry was posted on November 27, 2011 at 6:07 pm and is filed under Buddhist meditation, News, Programme, Teachings, Tibetan Buddhism. You can follow any responses to this entry through the RSS 2.0 feed. You can leave a response, or trackback from your own site.